The experts admit: Australia's Great Barrier Reef cannot be saved. Already half of the Reef has been killed by record warm water temperatures for the second year in a row. A 2015 official report concerned how best to preserve the Reef, but that optimism is no more. The latest aerial surveys show a bleaching event almost as severe as the 2016 record when two-thirds of the Reef experienced bleaching due to high water temperatures. Only the southern third of the Reef has escaped widespread bleaching. Bleaching occurs when coral eject pigmented algae in order to survive. El Nino contributed to the bleaching last year, but this year there is no El Niño effect and the bleaching is almost as bad. 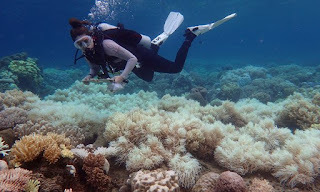 Dr. James Kerry of James Cook University, who undertook the aerial surveys said, “It takes at least a decade for a full recovery of even the fastest growing corals, so mass bleaching events 12 months apart offers zero prospect of recovery for reefs that were damaged in 2016." There has already been four severe events in the last eighteen years--1998, 2002, 2016, and now 2017. The rise in water temperatures due to global warming will continue to bleach the Reef. A reef expert who has focused on water quality told the Guardian that the federal government's efforts to improve the Reef's water quality have also failed. The loss of one of Nature's great wonders would mean the loss of one million visitors to Queensland, and drain $1b from its economy.